Fruit Fly: The Musical is the story of Max Wojtanowicz and Sheena Janson, who team up to find out whether a gay man and a straight woman — a fruit and a fruit fly — can “quit each other” to find true love? What makes that bond between gay men and straight women so special, so necessary, and SO fabulous? Wojtanowicz and Janson met as kids in community theater in the St. Cloud area. Fruit Fly tells their heart-warming story with music by Broadway veteran and recent Minneapolis transplant Michael Gruber. Billed as “a musical 20 years in the making,” their weird, wonderful tale of friendship reveals how uplifting it can be to feel safe, welcomed, loved…and fabulous. Wojtanowicz, one of the writers and stars of the show, has made his rounds in the Twin Cities theater circuit. He spent two seasons as a performing apprentice at the Children’s Theatre Company, as well as appearances with the Guthrie Theater, Minneapolis Musical Theatre, and many more. The show was written because a friend suggested you write about your friendship with Sheena. Why did you actually take them up on that and follow through? Max Wojtanowicz: Nikki Swoboda (who collaborated on creating Fruit Fly and also directed the show) suggested that we write something together because she saw something compelling in our relationship, and we were so in awe of this director believing in us that we thought we’d better do it! Nikki is the kind of person you warm to immediately. She’s got this kind, generous spirit, but she’ll also tell it like it is. We joke that Sheena and I are like contestants on RuPaul’s Drag Race and she’s like RuPaul: we want her to love us and believe in us, and we’ll do whatever she tells us to do. Were there any reservations about writing about yourself? MW: We were nervous at first that the show would seem like a flippant little vanity project: “Look at us, look at how funny we are! We’re Will and Grace, only cooler!” But this creative team really saw a universal message in the story of a gay man and a straight woman, and now the story has really evolved into one everyone can relate to: gay, straight, or otherwise. So if we were ever hesitant about writing about ourselves, that fear has all gone away. How did you manage to write about yourself, while making the show so universal? MW: You know, I remember reading Roger Ebert’s review of Brokeback Mountain when it came out, and this really stuck out to me: “Strange but true: The more specific a film is, the more universal, because the more it understands individual characters, the more it applies to everyone.” As we worked on Fruit Fly, I really tried to keep those words in mind, even though it seems contradictory. A great friendship can change, or even save, lives — it totally saved mine — and we believe in the power of our friendship so much that we just thought people would see themselves in us, in both the good and bad parts of us, if we kept it as truthful and honest as possible. Everyone knows what it means for a friendship to evolve. Why go the musical route? MW: Well, Sheena and I are both singers, but more than that, we are the kind of people who just burst into song with each other all the time. So we knew the show just had to have that kind of energy to it. We also knew that we grew up with musical theater, and we both really love and respect that form, and we wanted to play around with what it meant to tell a story with music. So the show has now really evolved into a simultaneous story about two friends going through change, and two actors creating a musical together. It’s a trip! You’ve hidden political messages throughout the show – a Vote No shirt in the set or dialogue about how we don’t choose who we love, for example. What was your goal with this show? MW: We premiered this show at the Minnesota Fringe in 2012, when there was a huge state-wide conversation going on around the topic of gay marriage at the time, but our show has nothing to do with gay marriage at all. We hoped that a straightforward, three-dimensional portrayal of a gay person onstage, one who isn’t just a silly sitcom character or a plot point, could shift an audience’s perspective about what a gay person looks like today. “Maybe there’s someone in our audience who doesn’t like the idea of gay marriage simply because he or she doesn’t know any gay people,” we thought. After seeing our show, they’ve seen one, gotten to know me a little, and they might see that a gay person deals with insecurities, heartache, and co-dependence just like they do. We already have enough labels dividing us, so let’s find what’s similar, human, and universal about us. Personally, this show would be a complete success for me if one person saw this show and walked away with those walls broken down, or if one young kid in the closet came with his best gal pal and they saw themselves in us, or if one parent struggling with how to connect with their gay or lesbian child had a new perspective. I think there’s a lot of different kinds of people who need a story like this, and I hope they show up. 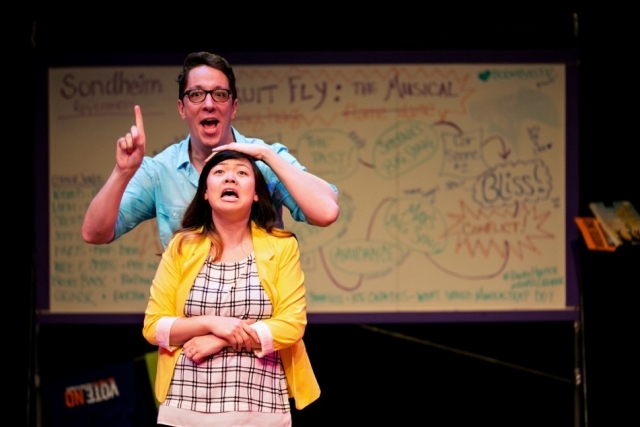 Fruit Fly: The Musical runs at the Illusion Theater through April 11. For more information and to purchase tickets, head to www.illusiontheater.org.